Spedeworth / Incarace would like to make all drivers and race fans aware of formula changes to take place at the fixtures scheduled for the weekend of the 16th & 17th February 2019. 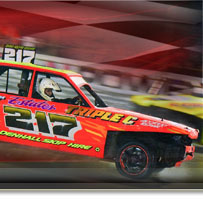 Due to the amount of ‘Back To Basic’ Bangers already booking in for our event at Great Yarmouth Stadium on Sunday 17th February and as a result of the restricted pit space at the venue the decision has been made to remove the Lightning Rods from this fixture and add the formula to the event at Birmingham Wheels Raceway the night before (Saturday 16th February) and this will now allow the event to be a joint points scoring meeting for both Spedeworth and Incarace registered drivers which now allows an extra meeting for the Incarace drivers. The meeting will also run as round 1 of the 2019 Polleysport/Yokohama Tyres Series. Back to Great Yarmouth and at time of announcing this news we are also asking that any Rookie Rods or Mini Super Twos drivers who intend to race at the event to please book-in ASAP. If the bookings for the formulas do not increase then the bookings will remain open for the ‘Back To Basic’ Bangers which may result in the formulas having to be removed from the fixture.